1....2....3,4,5....Great Knots on the Mozambique Coast !! While leading a birding trip to Southern Mozambique, Maans Booysen located and photographed no less than 3 Great Knots (Calidris tenuirostris) at the Barra Peninsula, near Inhambane, Southern Mozambique. 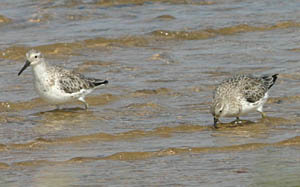 There is one previous record of Great Knot for the Barra Peninsula by Faansie Peacock in December 2004, but given these birds propensity to return to the same area, it is conceivable that one might be the same bird that Faansie recorded in 2004. The birds Maans photographed were seen on 20 September, near White Sands on the northern corner of the "Barra Peninsula". Contrary to Western South Africa, where Red Knot is very common, they are are scarce to say the least on the Mozambique Coast, so all "Knot-like" birds should be checked to see if they are Great Knot. Given the vast amount of estuarine habitat on the Mozambique coast, the possibility exists that there are more than just a handful of these birds present each summer. For more information on the precise locality of the Great Knot, contact Maans Booysen here. Maans Booysen manages the Hyliota Camp near Panda, where incredible Lebombo Ironwood Forests compliment Miombo woodland where the star bird is Olive-headed Weaver. The Ironwood forests hold substantial populations of Chestnut-fronted Helmet-shrike, Plain-backed (Blue-throated) Sunbird, Woodward's Batis and Yellow-spotted Nicator.